Paul Schmitt, of Costa Mesa, CA, has been designing and producing skateboards for nearly three decades. A skateboarder himself since he was a young boy, today his products are known world wide for their quality, performance and durability. In fact, Schmitt is so knowledgeable about skateboard construction, and so respected in the skateboard community; he’s earned the apropos nickname of, Professor Schmitt. Skateboarding’s history can be traced to steel wheeled skate scooters of the 1920s. Throughout the ensuing decades a generation of early skateboarders made their own skateboards by simply attaching steel wheeled roller skates to a 2x4 or other piece of wood. These early skateboards were dangerous and difficult to ride and offered very little in terms of performance. By the 1950s clay wheeled skateboards were being manufactured and were the first skateboards to offer any level of opportunity for performance. In the early 1970s plastic urethane wheels were introduced to the skateboard market and the world of skateboarding has never been the same since! Although the first person to make a skateboard is unknown, we do know that Professor Schmitt has made millions of skateboards. In fact, in 2005 his company reached a milestone in manufacturing its 10 millionth skateboard! Ten million! Placed end to end they would stretch across the United States and back! But Professor Schmitt didn’t stop when his company reached 10 million skateboards! His companies make more than 4,000 skateboards a day; 200 per hour; nearly three per minute! Professor Schmitt’s dedication to building the highest quality and most durable skateboards, that also offer the greatest level of performance, can be traced to the influence of the 100s of professional skateboarders who use his products. The feedback from his friends and fellow skateboarders has always been essential to the design and manufacturing of his skateboard decks. Now, with the development of the CreateAskate.org program, Professor Schmitt’s unique program is dedicated to helping young people create a hand-made version of one of his professional quality skateboard decks. 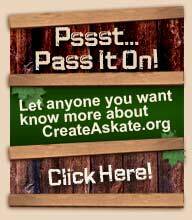 In establishing the CreateAskate.org program Professor Schmitt hopes teenagers around the country can discover for themselves a sense of pride and accomplishment as they create, with their own hands, a bit of relevance in their own lives. Skateboards helped change Professor Schmitt’s life...maybe, just maybe, participating in the CreateAskate.org program will help participants discover for themselves some of the same powerful consequences by creating their own personalized professional quality skateboard deck!